WASHINGTON (Reuters) - A cloak of invisibility may be common in science fiction but it is not so easy in the real world. New research suggests such a device may be moving closer to reality. Scientists said on Thursday they have successfully tested an ultra-thin invisibility cloak made of microscopic rectangular gold blocks that, like skin, conform to the shape of an object and can render it undetectable with visible light. The researchers said while their experiments involved cloaking a miniscule object they believe the technology could be made to conceal larger objects, with military and other possible applications. The cloak, 80 nanometers in thickness, was wrapped around a three-dimensional object shaped with bumps and dents. 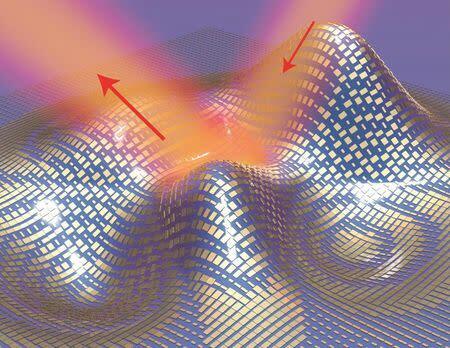 The cloak's surface rerouted light waves scattered from the object to make it invisible to optical detection. It may take five to 10 years to make the technology practical to use, according to Xiang Zhang, director of the Materials Sciences Division of the U.S. Department of Energy's Lawrence Berkeley National Laboratory and a professor at the University of California, Berkeley. "We do not see fundamental roadblocks. But much more work needs to be done," said Zhang, whose research was published in the journal Science. The technology involves so-called metamaterials, which possess properties not present in nature. Their surfaces bear features much smaller than the size of a wavelength of light. They redirect incoming light waves, shifting them away from the object being cloaked. The cloaking "skin" boasts microscopic light-scattering antennae that make light bouncing off an object look as if it were reflected by a flat mirror, rendering the object invisible. "The fact that we can make a curved surface appear flat also means that we can make it look like anything else. We also can make a flat surface appear curved," said Penn State University electrical engineering professor Xingjie Ni, the study's lead author. The researchers said they overcame two drawbacks of previous experimental microscopic cloaks that were bulkier and harder to "scale up," or become usable for larger objects. Ni said the technology eventually could be used for military applications like making large objects like vehicles or aircraft or even individual soldiers "invisible." Ni also mentioned some unconventional applications. How about a cloaking mask for the face? "All the pimples and wrinkles will no longer be visible," Ni said. How about fashion design? Ni suggested a cloak that "can be made to hide one's belly."